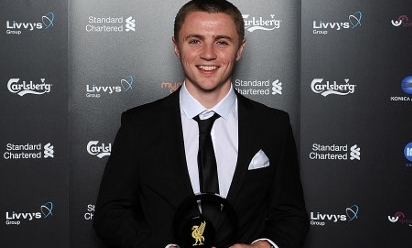 His was a typically humble and fleeting acceptance speech, but Jordan Rossiter wore a smile that lit up the whole room as he picked up the Academy Player of the Season award on Tuesday night. Before a star-studded ceremony on the banks of the river Mersey, Rossiter's displays throughout 2013-14 were acknowledged by his teammates as Liverpool's first-team players and staff looked on. Beaming with pride, the young Scouser took to the stage to accept a prize which recognised his unyielding efforts and vast progress during the course of the season. The youngster has risen to prominence at the heart of the club's U21s side under the stewardship of Alex Inglethorpe over the last 12 months. In December 2013, he travelled with Brendan Rodgers' first team to Stamford Bridge and was named on the substitutes' bench for the Reds' narrow 2-1 defeat at the hands of Chelsea. Then, on March 24, 2014, the youngster signed his first professional contract with the club, on the day he turned 17, having joined Academy teammates for regular trips to Melwood. After collecting his award on Tuesday, Rossiter made his way back-stage to reflect in more detail with Liverpoolfc.com - and explained how he simply cannot wait for next season to come around. "It means the world to me to win this," said the tough-tackling midfielder. "I couldn't have expected it at the start of the season - to be at an awards ceremony and to have actually won the prize. I just can't wait for next season now. "There are plenty of other great players at the Academy and without them I wouldn't have been able to win this. You can never really be too happy with your performances, because that way you don't end up improving. "I'm just glad this season has gone well for me. I don't really feel pressure, but it's always nice to be recognised for your performances. I just need to keep on getting better, working week-in, week-out. I need to have a good summer now and then come back pre-season ready to go again. "It's a dream come true to [train at Melwood], but the coaches at the Academy help us out just as much and that's a good thing."